The new 1.2 release is available starting from February 15th 2014. 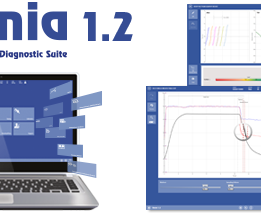 OMNIA 1.2 covers 3 brand new modules (TGV, DLCO, 6MWT) together with a wide range of important improvements and some minor bug fixes of the previous version. The new upgrade is free of charge for all OMNIA 1.x users and for those who have purchased Quark PFT, Quark Spiro, Spiropalm 6MWT after October 1st 2013 (proof of purchase required).